Blue Shirt Dress - Pretty Little Thing Khaki Waterfall Coat - Pretty Little Thing Grey Duster Coat - Missguided Striped Bodysuit - New Look Red 3/4 Striped Top - New Look Firetrap Cable Knit Hat - M and M Direct Firetrap Queen Black Boots - M and M Direct Grey Suedette Block Heel Boots - New Look I'm starting to feel more inspired with fashion at the moment. I'm really enjoying simple 'classic' pieces and that means stocking up on those casual coats and striped items. I have this coat in a grey colour but I've been eyeing this coat as it's khaki green. Khaki is a colour I really love wearing and I feel like it goes well against my skin tone. 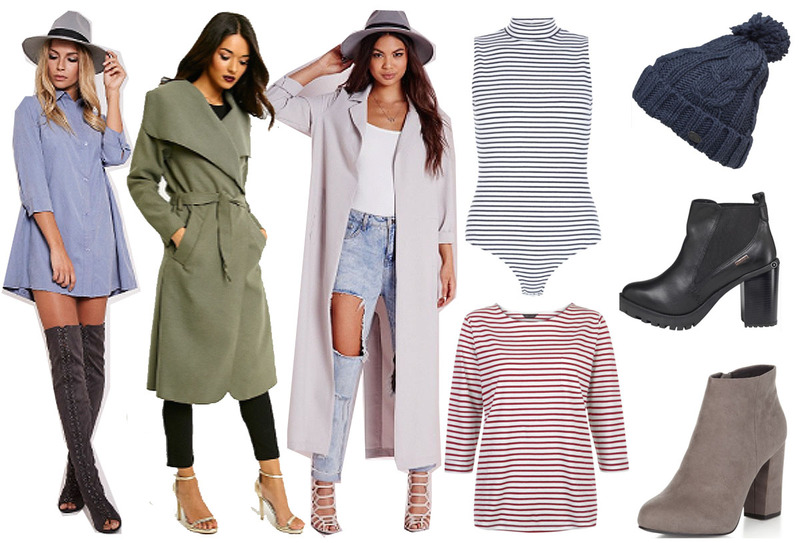 This coat is an absolute steal as it's only £20 too! Stripes will always be my favourite sort of tops to wear. You can never have too many striped tops right? You can check out my last outfit post (featuring a striped top) here. I think when it comes to bagging yourself a great and affordable striped top there's no where else to look then New Look. I've had a few striped tops from New Look and they've lasted me so well. I really want to get my hands on this one. New Look have some amazing offers on right now and you can currently get £10 off orders over £50 online! One place i've never really looked for when it comes to fashion is M and M Direct. I didn't know that they stock brands including Firetrap, Nike, Ugg, Converse to name a few. I am really into wearing my bobble hats to keep me warm at the moment and this one caught my eye. I am also loving the simple classic type pieces. They are forever and easy to mix and match.